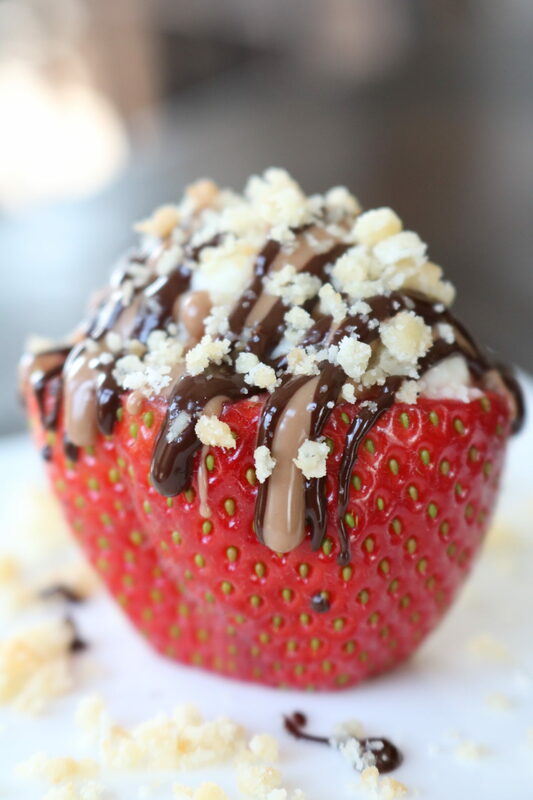 Whoever doesn’t have faith in the old saying ‘the way to a mans heart is through his stomach’ hasn’t tried our #APWU Sweet Vanilla Ricotta Strawberries with Chocolate Drizzle and Cookie Crumbs… Lucky for us we already have our husbands hearts because, well, we sort of forgot to share…whoops. Add cookies to a ziplock bag and crush until they becomes fine crumbs. Set aside. Rinse strawberries and pat dry with a paper towel. Slice the bottom of each strawberry so that it sits level. Remove the green tops and hollow out each strawberry with a small melon baller. Set aside. Add cream cheese, vanilla, sugar, and ricotta to a medium mixing bowl and mix with a hand mixer until well combined; approximately 1 minute. (The mixture is not going to get completely smooth because of the ricotta texture) Transfer ricotta mixture to a ziplock bag and cut the tip of bag to create a disposable piping bag. Add the chocolate bars to separate bowls and microwave until thoroughly melted. Add a pinch of cookie crumbs to the inside of each strawberry and then add a small drizzle of chocolate. Fill the strawberry with the vanilla ricotta mixture. Using a small spoon gently drizzle chocolate over the tops of the strawberries alternating between milk and dark chocolate. 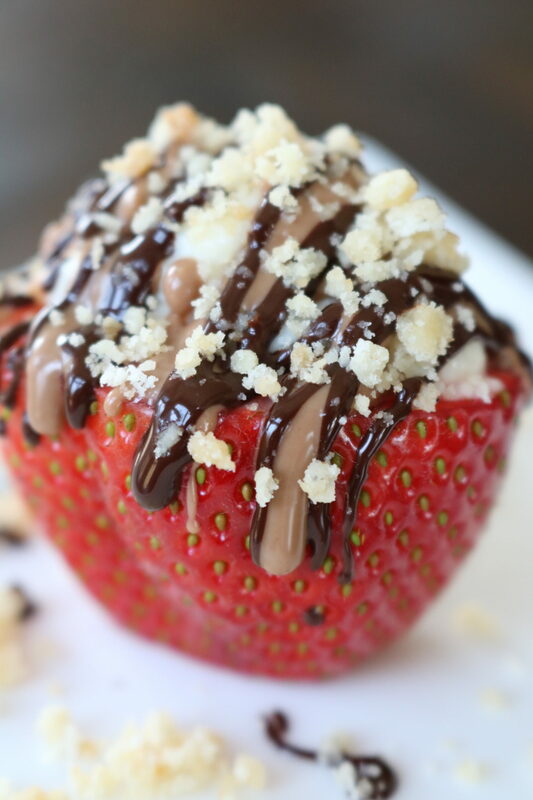 Top each strawberry with cookie crumbs and an additional dark chocolate drizzle. Enjoy! Sign-up for the APWU newsletter to get the first look at new posts!